Dartmouth College had the highest return on their endowment in Fiscal Year 2012 among Ivy League colleges reporting data (graph from “The Dartmouth” by Maggie Rowland, “The Dartmouth” Senior Staff). 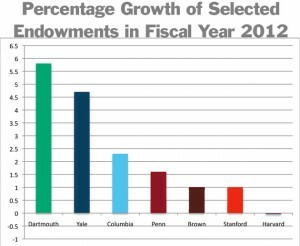 Ivy League endowment numbers are out for Fiscal Year 2012. So which Ivy League university had the greatest return on its endowment? That answer would be…Dartmouth College. With a 5.8% return on its endowment, Dartmouth outpaced all seven other Ivy League colleges. This figure, however, is down significantly from Fiscal Year 2011 in which Dartmouth witnessed an 18.4% return, according to “The Dartmouth.” But, in Fiscal Year 2011, Dartmouth had the smallest return on its endowment among the Ivy League colleges so they’ve gone from last to first within one year’s time. That’s a pretty incredible change. So who do you think is handling Harvard’s money? Do you think they’ve got some explaining to do when all of the other Ivy League schools reporting data cited returns? Keep in mind that Harvard University has the largest endowment of any university in the United States, but a horse is a horse and a loss is a loss. Let us know your thoughts on the Ivy League endowment numbers by posting below!